All countries have their peculiarities, little things that make us smile, frown or both at the same time. Noticing them is one of the things that, on good days, makes travel fun. On less good days they might make us want to pack up and go home where everything makes sense and buying a bottle of water or a stamp really will just take a minute. 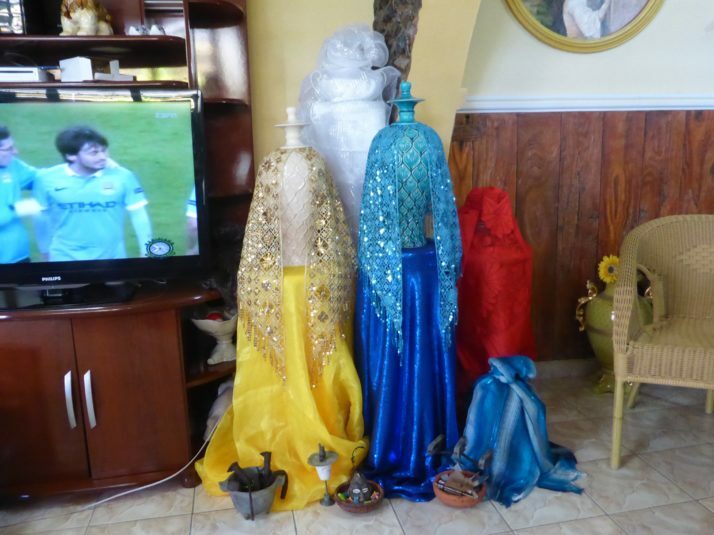 Here are some of the curiosities we found during our travels in Cuba. Classic cars really are everywhere and really are used by normal people though a fair few have had immaculate overhauls and are now used as tourist taxis. For general range we loved wandering the streets of Holguin, but for a parade of museum worthy beauties check out the main street in Varadero or Parque Central in Havana. Cuba operates a dual currency system with the convertible peso (CUC) which is pegged to the US dollar, and the national peso (MN) of which there are 25 in each CUC. As far as we can tell this dual system results in three things – first to extract extra money from foreigners, second to make scamming said foreigners particularly easy (the notes for the two currencies look very similar and both are commonly refered to as ‘peso’), third to create inequalities in the society between those who have CUCs (usually those who work in the tourist industry) and those who don’t. It was much more confusing than other countries we’ve visited which run two currencies (Cambodia and Uzbekistan spring to mind where the US dollar is commonly used alongside the national currency). 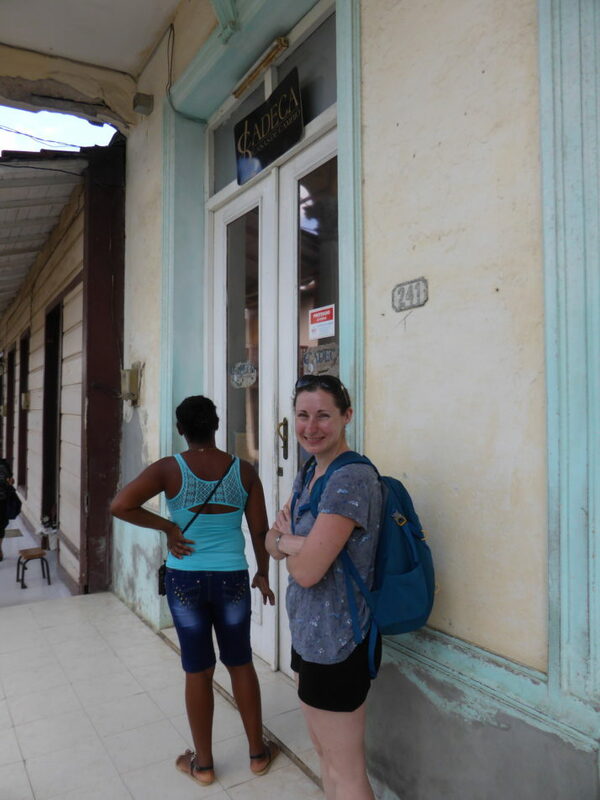 In Cuba we carried two purses to try to minimise any mistakes. As you can tell we’re pretty critical of the dual currency system which seemed to have only downsides. 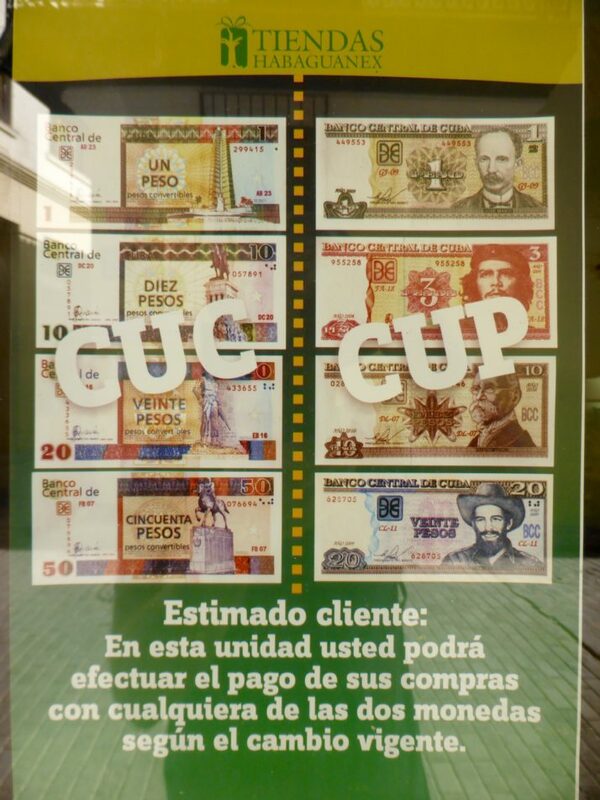 Poster showing convertible peso notes on the left and national pesos on the right – similar, no? The easiest way we found to tell them apart was that the CUCs have pictures of monuments and the MN notes have pictures of historic figures. Women of all ages and shapes tend to dress in head-to-toe lycra, or if they work in an office or have a uniform they wear an extremely short tight skirt and fishnet tights, again regardless of age or size. Queues are an inevitable part of life for Cubans and even as a tourist you should get used to it. Many things take longer than it seems they ought to including money exchange (all notes are scrutinised meticulously and counted at least three times), and shops will hold a queue at the door if they think there are too many people inside. Note that the queue is not a line and the correct etiquette is to ask ‘el ultimo?’ (the last?) when you arrive then you only need to remember who is directly before you. 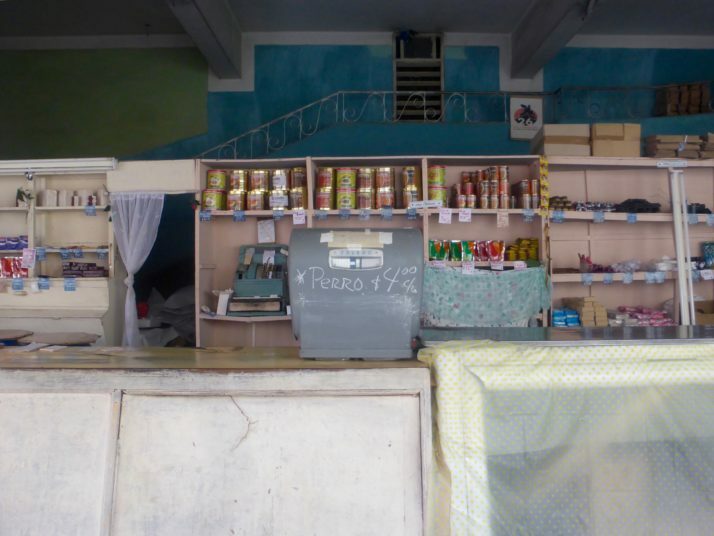 Shops are very strange – local (national peso) shops selling dry goods etc are very cheap and look extremely sparsely stocked (there’s a chain called Ideal Market which always made us laugh because it definitely doesn’t look to be ideally stocked), CUC shops seem better stocked but are still very limited in their selection (we more than once had to go to three shops to find a 5L bottle of water). Although a limited range of basics (rice, beans, sugar, veg, etc.) are cheap, anything slightly ‘luxury’ is expensive (e.g. crisps, toiletries). Acrylic nails are a big thing among Cuba’s women and we often saw ladies sporting unfeasibly long nails decorated with flashy bright designs and studded with fake jewels. Ice cream parlours are very popular and unbelievably cheap (so much so that we couldn’t believe that prices were in national pesos the first time we went). 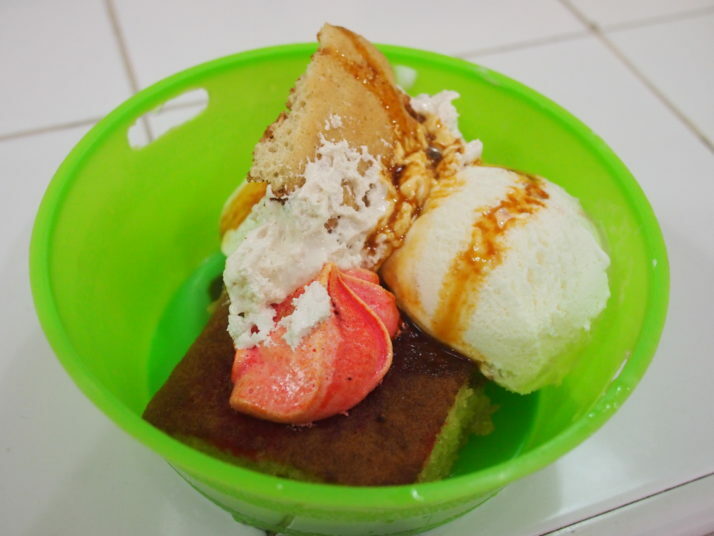 They are nice cafes or outdoor patios with table service – one scoop of ice cream will generally cost about 3 pesos so that a slice of cake with two scoops might be around £0.20! It’s not quite Italian gelato but the ice cream’s pretty nice. A very affordable and addictive afternoon pit stop! Cake, two scoops of ice cream, sauce and a swirl of marshmallow fluff – not bad for £0.20! Weekly fumigation of all buildings is mandatory in Cuban cities and we often saw men in what looked like military fatigues carrying around engines with long smoking pipes. On the plus side it means that it is very unusual to see mosquitoes (in the cities anyway) and it’s not necessary to use repellant. On the other hand we were concerned about the potential adverse health effects of the insecticide settling inside homes for all residents, but especially for the fumigation teams who for the most part didn’t even wear masks never mind full hazmat suits. 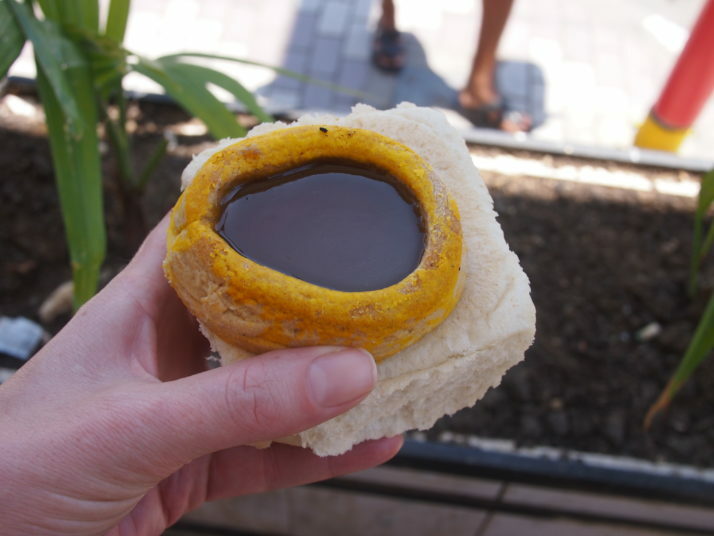 If you buy anything from a national peso shop or stand then the best you will be offered for carrying is a small piece of paper or cardboard to hold the food if it is intended to be eaten straightaway and might be messy (e.g. pizza, cake). For fruit and veg or even bread from the bakery you need to take your own shopping bag. We saw carrier bags hanging to dry on washing lines and even washed a couple ourselves! Bars and cafes with long opening hours often stop serving for an hour at the end of the afternoon. We came across this twice, if you already have a drink then you can stay at your table but they won’t serve anything else during the hour. We couldn’t work out if it was to give the staff a rest or to cash up the till partway through the day or some other less obvious reason. I was especially confused when we tried to go to an ice cream cafe in Moron and asked if it was closed and the waitress kept repeating ‘no, it’s not closed’ but then wouldn’t serve us! 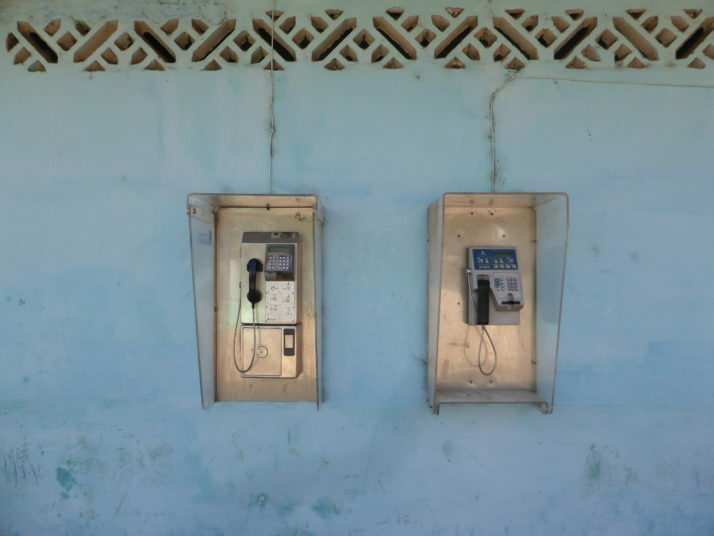 Payphones are common in Cuba and we often saw people using them. 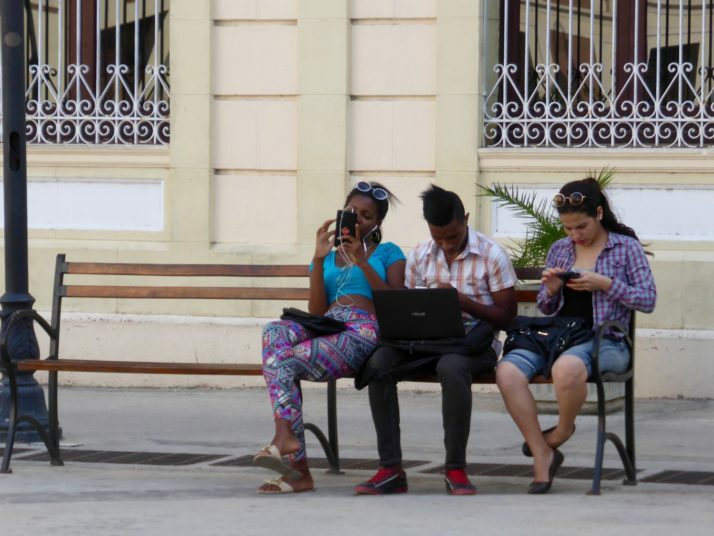 Cuba was one of the most difficult countries we’ve visited for internet access. Basically internet is tightly regulated though we as far as we could tell no websites were blocked. Major squares and big hotels have wi-fi available but you need to buy access cards to log on. These cost CUC$3 (£2.10) each for one hour’s access and so we decided to pretty much live without internet for our stay and actually it wasn’t so bad – even Andrew managed! One thing I missed was the ability to go on Tripadvisor to check restaurant reviews as finding good food wasn’t easy. Locals seem to mostly use the internet for video calls and in the evenings the squares are full of families crowding around a smartphone or tablet. 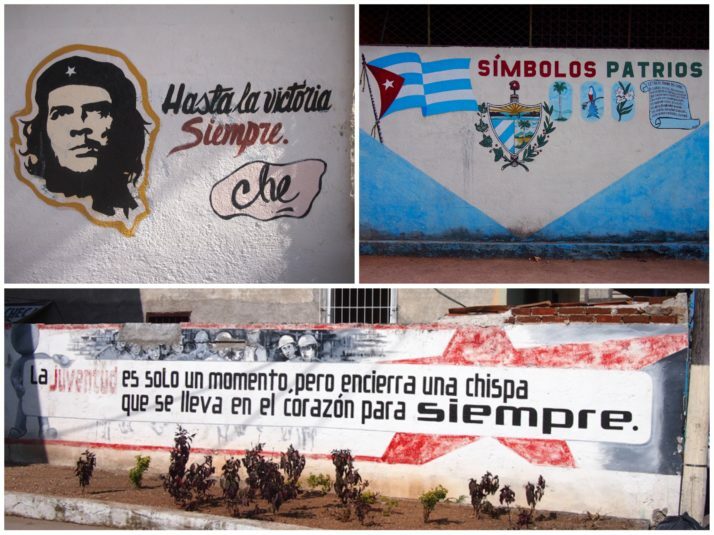 Cuba is a country without advertising, instead walls and billboards display countless portraits of Che Guevara and propaganda messages – sort of like political motivation posters. 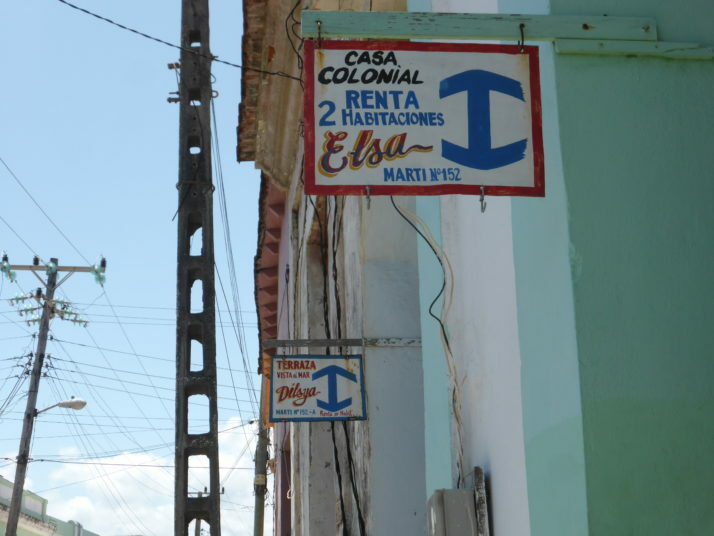 In recent years, Cubans have been able to sell property but there aren’t any estate agents, instead we saw lots of hand written ‘this house is for sale’ notices pinned up as we walked the streets. Hostels don’t exist in Cuba and the impression we get is that the lower end hotels don’t offer very good value for money. So unless you can afford a five star resort (and want the insulation from the outside world that brings), the best places to stay are casas particular – state licensed guesthouses. We found them to be friendly and good value for money – standards of cleanliness are high and every room came with hot water and AC though some of the beds were less comfortable than I would have liked. Despite the fact that there are A LOT of tourists, surprisingly few people speak English. Several of the casas where we stayed didn’t speak any English so it’s a good idea to practice your Spanish before you visit or prepare for conversations by dictionary. As not much development has happened since the late 1950s many architectural features which elsewhere might have been lost are still there to see in Cuba . 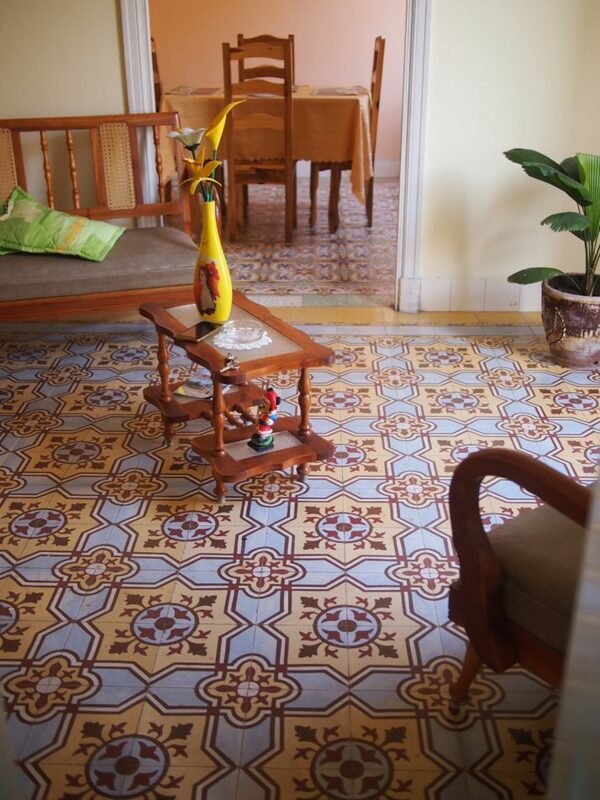 Although much of it is in a poor state of repair many buildings (including several of the casas where we stayed) still have beautiful early 20th century tiled floors and ridiculously high ceilings. Although much of the country is at least nominally Catholic as you might expect from an ex-Spanish colony, if you know what to look for it’s easy to spot signs of Santeria, the religion which is a fusion of Catholic saint worship and African animism. This arose when the the large slave population had to at least put up a pretence of being Christian. Initiates have to dress all in white for one year and the representations of saints/gods are not hard to find. Music is ever present in Cuba. Bici-taxis often have a stereo rigged up and it’s common to hear loud music wafting out of houses as you walk the streets. We’ve done similar lists for China and Japan, as well as tips for travelling in Bangladesh. 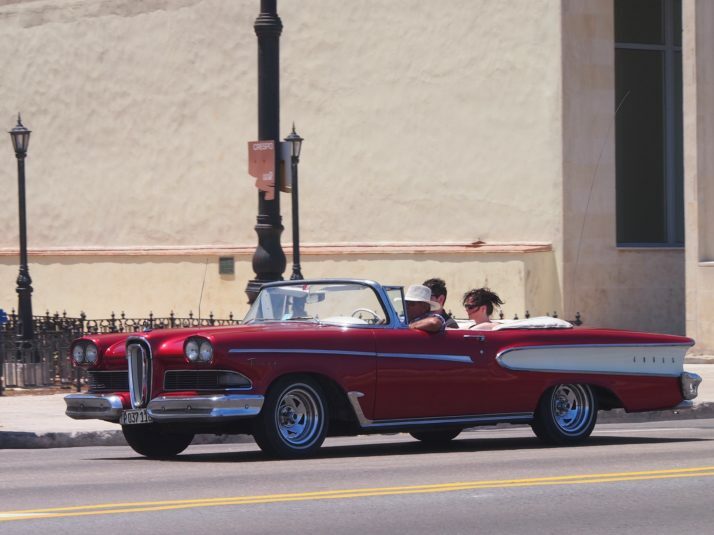 This entry was posted in Experiences, Travel and tagged Cuba on June 10, 2016 by Julie.